The Waimea Pro was well known for its vibrant graphics printed on a vinyl deck. The vinyl was laminated on top of HDPE using a patented tri-lamination process. The aesthetic benefit of cool graphics came at the cost of a heavier board. 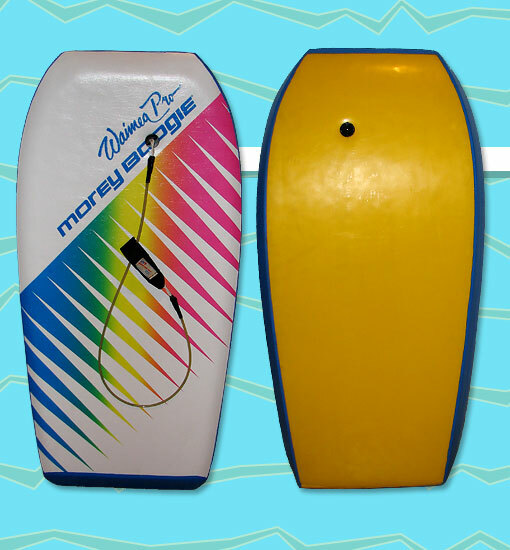 Aside from its colorful vinyl deck, the Waimea Pro was notably similar to the Mach 6 -- both boards had the same dimensions, a square tail, and a non-Surlyn slick skin. The graphics on the Waimea Pro changed annually. The second generation of Waimea Pro (shown here) featured a rainbow colored spike design.